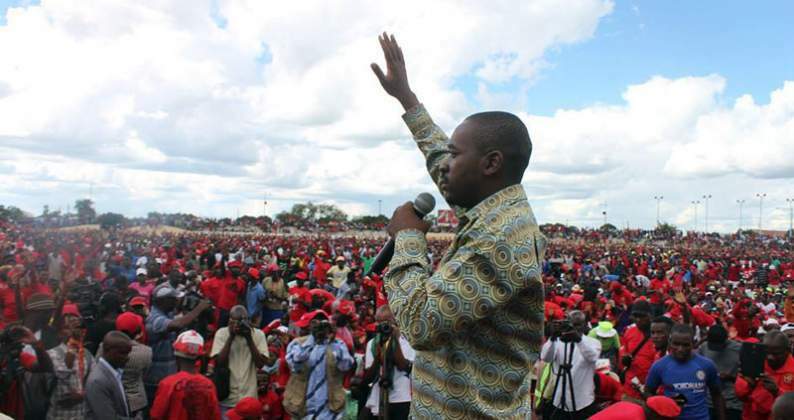 MDC Alliance leader Nelson Chamisa yesterday threatened to pre-empt the Zimbabwe Electoral Commission (Zec)'s vote-rigging antics by prematurely announcing results for the July 30 elections to enable the electorate to compare the figures. "This time we are going to announce the election, not Zanu-PF. We will have a system to have all the results from polling stations. So from voting, we will tell you where to go and wait in order to protect your votes," Chamisa said. In 2008, then MDC-T secretary-general Tendai Biti was arrested and charged with treason for announcing the results of the elections before the electoral agency had released its own tallies. The charge was later dropped when the MDC-T and MDC formed a coalition government with Zanu-PF. Biti, who is now one of the principals of the MDC Alliance, last week threatened to prematurely release results of this month's polls to counter Zec's machinations. Chamisa added: "This is the last demonstration that we will do and go back home. On future demonstrations, no one will be going home." "Next week, we are meeting to assess the situation and if there is no movement on the ballot issue, it means there is no sleeping anymore. We have lost everything, but we are prepared to defend our right to integrity of the vote and the voters roll," the youthful opposition leader said. "Our agenda is that we will not get into an election with outstanding issues, but this doesn't mean we are not going to have an election. Unlike in the past, we will not boycott any election. This is not a Zanu-PF primary election, but a national election and we have to agree on how it is going to be conducted," Chamisa said. The MDC Alliance leader said Zec chairperson Justice Priscilla Chigumba was only doing the bidding for the ruling Zanu-PF party. He also accused President Emmerson Mnangagwa of plotting to rig the forthcoming elections using "his Russian friends". "Right now, they have Russians in Mt Pleasant, about 64 of them. They think I don't know, but I am being told by sources within the military," Chamisa said. "I am watching them. They brought others and if they are helping Zanu-PF in elections, then we have a problem. Sovereignty of a country doesn't allow having foreigners coming to interfere with our electoral processes. We are taking up that matter and we are not going to budge." He said he was sure of winning in this year's polls because of the divisions in Zanu-PF and vowed to give Mnangagwa sleepless nights. The opposition party further alleged that Zec had refused consensus and full disclosure of the source, security, traceability and openness of the ballot paper. The Chamisa-led alliance also claimed that Zec had given Zanu-PF access to its database and failed to guarantee equal media access to all parties in the polls. Chamisa demanded the urgent release of the final biometric voters' roll, in a searchable and analysable format with requisite biometric features. He also said the roll should be audited while the ongoing printing of the ballot paper should be halted pending buy-in from all stakeholders. He said he was aware Zanu-PF was intimidating villagers in rural areas, and threatened to deploy party youths to protect the villagers. Biti and #ThisFlag founder Evan Mawarire said people from all walks of society should unite to stop the injustice in the running of the month-end elections.